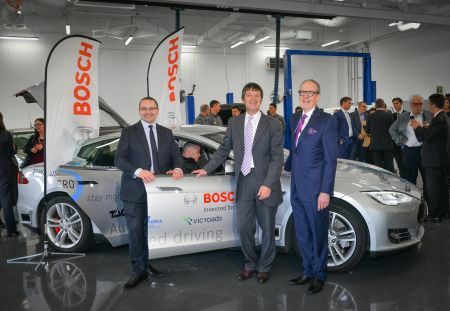 The Andrews Labor Government has partnered with Bosch, the Transport Accident Commission and VicRoads to build the first vehicle developed in Australia with self-driving capabilities. Minister for Roads and Road Safety Luke Donnellan today inspected the new vehicle and met with the Melbourne-based Bosch engineers who have been working for 12 months developing the car. The $1.2 million investment has helped Bosch develop the self-driving vehicle at its Australian headquarters in Clayton, which has been designed to navigate roads with or without driver input and includes technology to detect and avoid hazards such as pedestrians, cyclists and other vehicles. Trials of the vehicle will be used to inform the development of regulations and infrastructure to enable similar self-driving cars to operate on Victorian roads when they become commercially available in the future. The trial will also help VicRoads better understand how motorists use self-driving vehicles and the changes needed to prepare for the future. Traffic management experts and urban planners will get a better understanding of the need to reconfigure road networks and traffic signals to optimise safety and the flow of vehicles across the network. Victoria is leading the way in this new technology with the vehicle able to gather information from inbuilt sensors and cameras to build a complete picture of what’s on and around the road in order to navigate the road safely. Self-driving vehicles are an important step to reducing road trauma with 90 per cent of crashes resulting from human error. The introduction of highly-automated vehicles has the potential to help Victoria achieve its Towards Zero vision – a future free of deaths and serious injuries on the state’s roads. Next week, Melbourne will host the 23rd World Congress on Intelligent Transport Systems with the latest transport technology on full show and one of the centrepieces will be this self-driving vehicle.